Survive | Be Strong | Be Safe | Believe! Twilight Camp - "I Survived"
WCCO's Jason DeRusha features Twilight Camp Girls at the MN State Fair. On a very hot day at the state fair, we were asked to show off our Twilight Camp activities at the council's Girl Scout Booth. Girl Scouts Lilly, Brooke, and Haley challenged WCCO's Jason DeRusha to eat a bug on a stick. The girls helped work the Girl Scout Booth and demonstrated how to eat a bug to passing fairgoers. They were featured by Jason on WCCO Channel 4. We were asked to show off one of our Twilight Camp activities at the Minnesota State Fair, so Girl Scouts Lilly, Brooke, and Haley helped work the Girl Scout Booth and demonstrated how to eat a bug to passing fairgoers. They were interviewed by KARE11 Live at 5. Twilight Camp 2013 Featured on Fox 9! 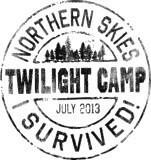 KMSP-TV Fox9 featured Northern Skies' Twilight Camp 2013 in a segment on FOX 9. The station's Rob Olson came out and spent an afternoon with the girls at camp, watching them practice survival skills and interviewing a few of the girls and staff.